When August started, you could still make a fairly convincing argument for it still being summer. 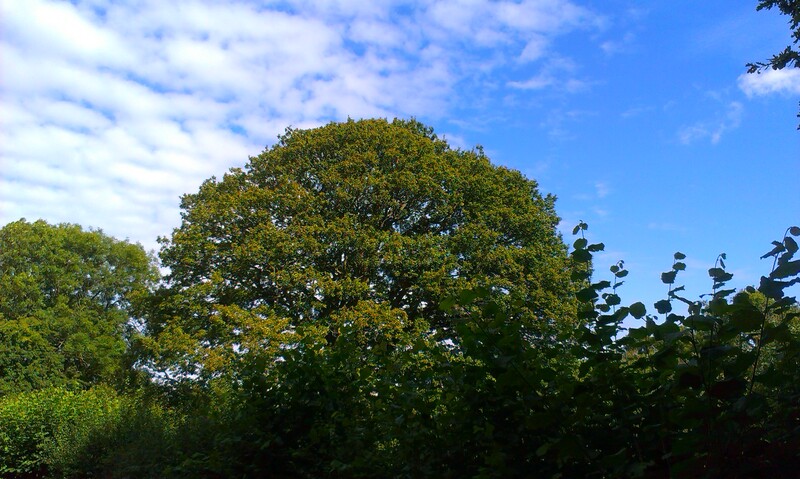 We had plenty of hot sunny days with a few gloriously blue skies off-setting the wonderful greens from the oak and the hedge in front of it. But it wasn’t long before I felt there was quite a change to the air on the early morning walk. A tinge of coolness on the edge of the breeze that hadn’t been there before. Much of the hedgerow undergrowth has died back now and views are beginning to open up again through the gaps in the hedge. By this morning, there really isn’t any doubt that we’re now at the beginning of autumn. 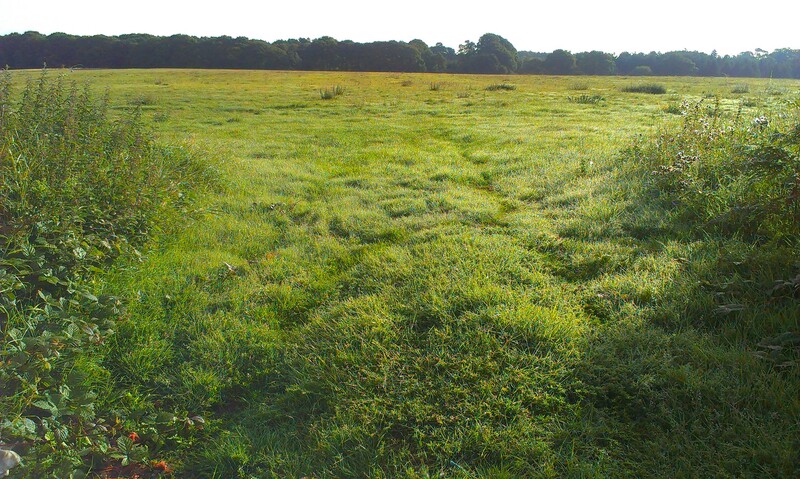 Thick dew on the field this morning. And berries appearing all along the lane. 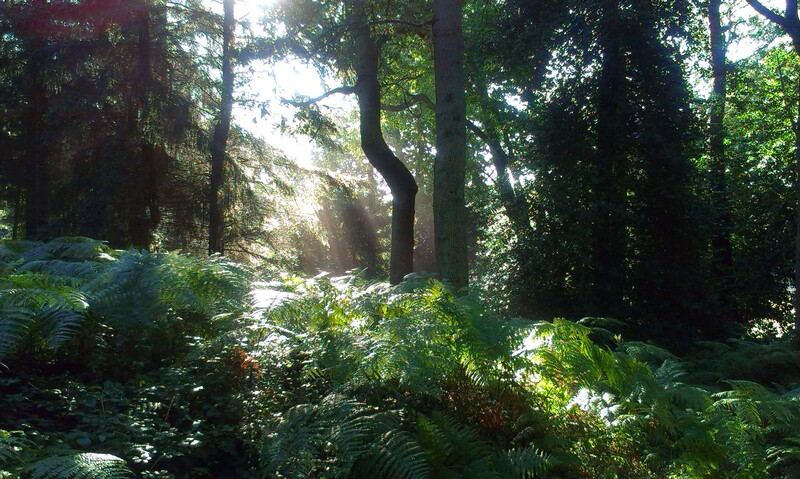 There was a different quality to the light through the trees. Too soon to be thinking about that. Sounds from upstairs – time to be off. Enjoy the rest of the summer, back into the swing again very soon. 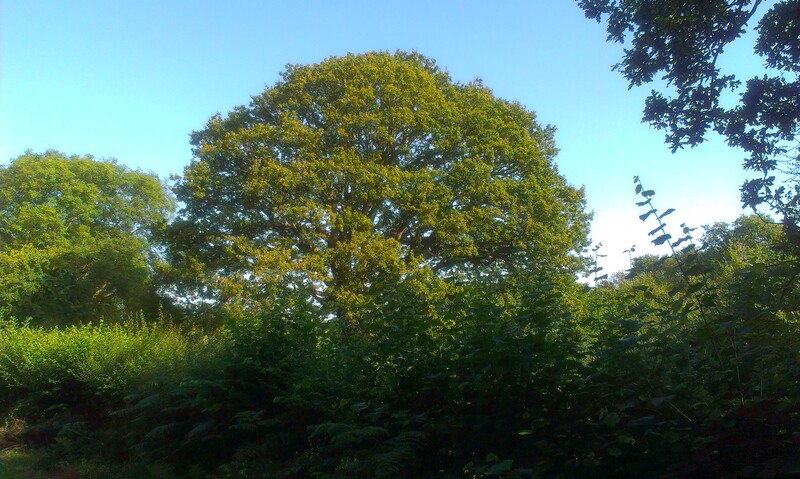 For more or less daily pictures of the oak and what’s happening on the lane, follow me on Instagram or watch the bar at the side of these posts. It seems to be early this year or is it just that the summer was early and so good that we’ve all got used to it and expected it to go on for ever? There is definitely a different colour to the early morning light these days as well as a feeling of things drawing to a close. I remember having a teenage daughter and how difficult it was to get things done that you want to do! I think the phrase ‘like herding cats’ was designed specifically to describe encouraging teenage girls to do anything! I wonder about autumn, we usually go away towards the end of August and often find that the first week is reasonably warm but after that it gets cooler – still lovely though, just in some way tipped over the balance. It’s good to be back on your blog, if fleetingly. Like you, I find summer is not good for blogging. Autumn is lurking in the undergrowth here too. There was an amazingly heavy dew on our lawn this morning and I spent time last week with my granddaughter picking up conkers from our hedgerow – they weren’t ripe but they will be soon. 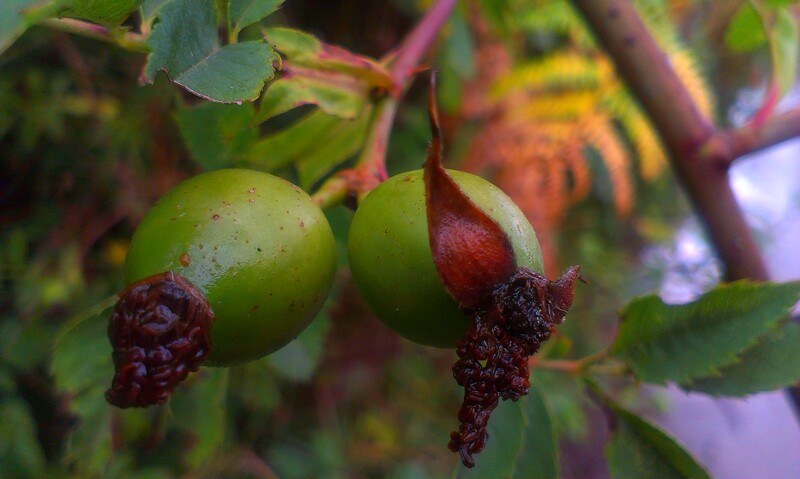 Your photos this time are particularly evocative – those rosehips and the holly berries are wonderful. What a treat! 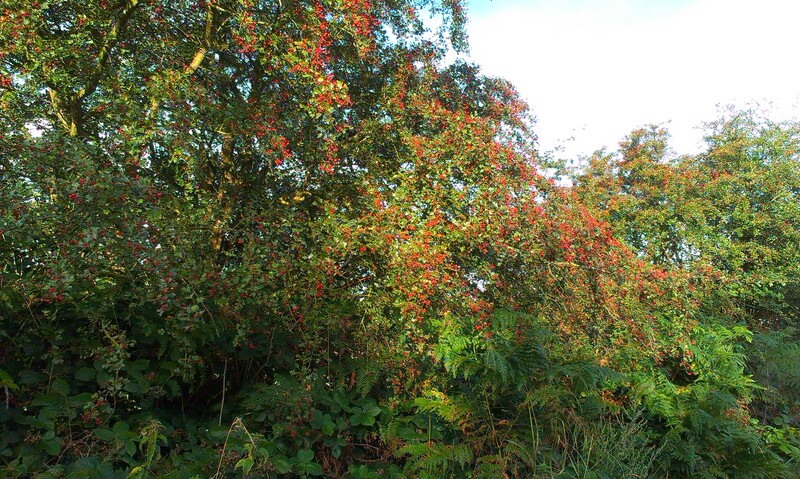 Thank you – yes, good to see you around too.Such a lot of berries this year – and yes, our conkers are well on their way too. So not ready for summer to end, but it’s starting Over here too. ‘Herding cats’ is the phrase I use in reference to my children too, though only one is a teenager. Oh yes, even though Autumn is my favourite season, I can’t help being a little melancholy when the holidays are over and the girls go back to school – but I soon get over it! I’ve been watching your Instagram pictures and your holiday reminded me a lot of our family holidays when I was young – albeit thousands of miles away – very laid back and lovely. It’s way too soon for autumn and I dread to think what lies beyond that. The holly bushes seem to be bearing a lot of berries here too. 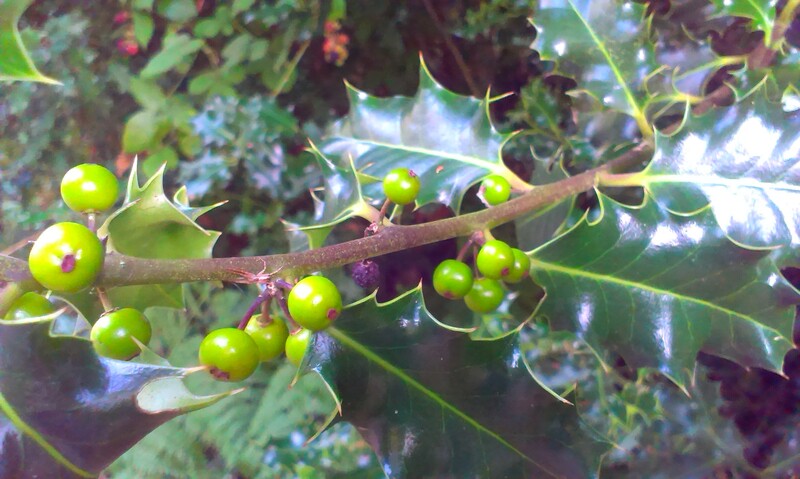 Lovely post, Anny, and I have noticed a good crop of holly berries here, only yesterday. Beautiful photos! You can feel that autumn is coming, and I love it, too. Autumn is my favourite season too, especially those crisp golden mornings and also the foggy ones! My laptop spends the summer more or less separated from me. Be strange to have it back! I used to get quite stressy about it, but these days I tend not to bother – either way doesn’t make any difference, I still end up waiting for them to go back to school before I get back to normal. Oh it must feel quite different after France! There are a lot of blackberries this year, I picked some at the weekend when I was walking the Delinquent Dog – quite an exercise with his lead in one hand, but at least he seems happy to amuse himself in the hedge looking for mice, while I pick. Not very different, Anny. We’re in southern Normandy which has a climate very like that of southern England. In any case France has had a very odd summer, with much more rain and less sun than normal.